The Spotmatics were the first autoexposure SLR - or, at least, the first successful autoexposure SLR. 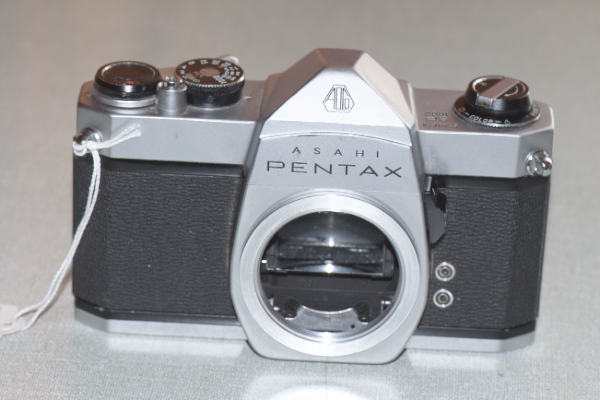 They built on Pentax's earlier success with the manual SLRs. Despite the name, the exposure system was not a spot system but was a centre weighted system. 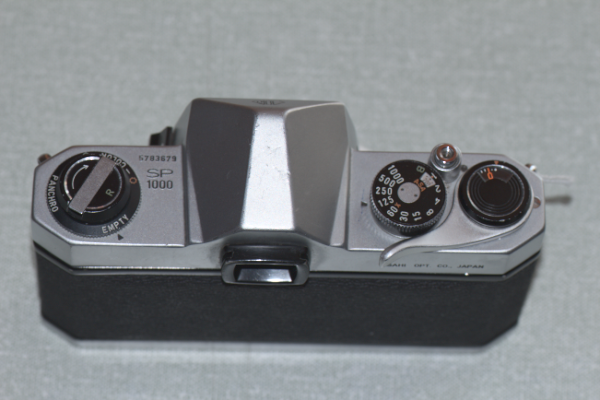 The SP1000 (and SP500, which was introduced at the same time) built on the design of the original Spotmatic. For anyone who is used to SLR cameras from the 1960s and 70s there are no surprises here, partly because this camera helped to define the genre. They were made between 1973 and 1976. So - a general description. The camera measures 143 by 92 by 88 mm and weighs 610 g (body alone). This is heavy by modern standards - particularly compared to Pentax's later K-mount ME series. I have no objection to weight in a camera if only because weight helps with stability and results in less camera shake. The layout of the camera is pretty much standard. On the left is a fold-away rewind crank. Around this is an aide memoire for the type of film in use. This gives the options of Empty, Panchro(matic), daylight colour and tungsten colour. The Empty setting is particularly useful as I often have more than one film camera on the go and on occasion open a camera only to find a part-used film inside. Panchro refers to black-and-white film (which is usually panchromatic). The two colour options are for outside and inside use respectively and refer to the white balance of the film. In the centre of the top plate is the lump of the pentaprism with the viewfinder behind. Traditionally, this is where the accessory shoe is put but the SP1000 has no accessory shoe as standard. Those who needed one could buy one as an optional extra which fitted into a groove around the viewfinder surround. To the right of the selector dial is the film advance lever. This is metal and is slightly curved to allow the user's thumb to access it. I prefer this to Pentax's later style of a plastic tipped lever that stands proud of the body. The centre of the film advance contains the frame counter. This automatically resets to -2 when the back is opened. When you advance the new film to get rid of the fogged portion on loading, the counter will point to zero. 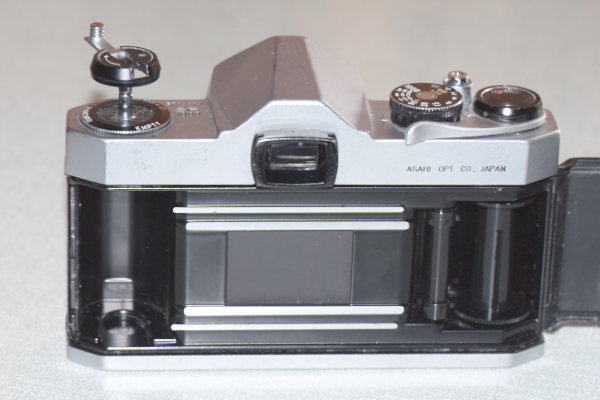 Between the selector dial and film advance and slightly forward of them is the shutter release button. This is threaded for a standard cable release. The front of the camera has three items (the back is entirely clean). These are the meter switch and two PC (Prontor-Compur) flash connectors. The meter switch switches on the TTL (Through The Lens) meter and stops down the diaphragm. This is basically a shutter priority system. The user sets the required shutter speed and then turns the aperture ring until the needle in the viewfinder is centred. When you switch off the meter (and you need to remember to or you will rapidly flatten the battery) the diaphragm should then open again to allow you to finesse the composition. On my specimen, this did not happen initially, I assume from the lack of use as it will eventually open itself. I have soaked the linkage with naptha and worked the switch repeatedly and it now works. The diaphragm stop-down system operated by the shutter release works fine as this is a completely separate system. The two PC flash connectors are marked for FP and X. FP is for fast flash bulbs and will synch at any shutter speed. X is for electronic flash and will only synch at 1/60 or slower. This is an old-fashioned camera and it is fairly heavy (610g) - much more so than a Pentax ME Super (445g) or OM10 (450g). Weight is not necessarily a bad thing as it enhances stability. It is much easier to hold a heavy camera steady than it is a very light one. The down side is when you are carrying the camera all day especially when hung around your neck. The focusing screen is a Fresnel screen with a microprism ring in the centre. The microprisms break-up the image when it is out of focus. Best focus is achieved when the microprisms disappear. There is no split-image centre here as many SLRs have but the camera is easy to focus without it. When you press the shutter release, the action is quite light - no heavy 'clunk' as with my Zenit or Praktica cameras, although it is still noisy compared to my leaf shuttered rangefinders. Very impressed - both with the camera and with the Helios-44M lens. I had no battery for this test, so exposures were manually sorted with my Ikophot meter.